Higgins Construction are working in Islington on the King Square Estate. The 148 week development comprises the construction of new mixed tenure accommodation including independent living space and landscaping on an existing estate. Amongst communicating with over 800 units, both commercial and residential, we are also neighbours with two other contractors who are working both on and next to the estate. 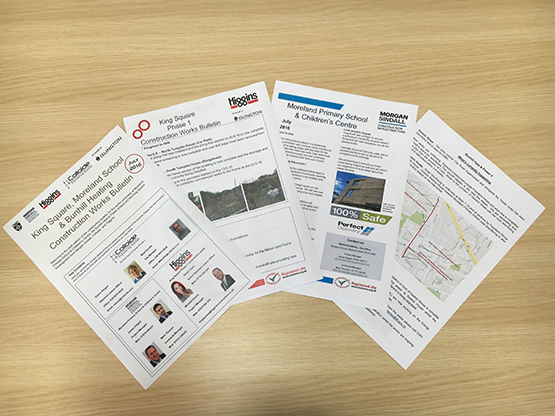 To keep communications simple and effective, we have collaborated a joint contractor newsletter, and are all taking turns with distribution responsibilities. This way, the residents can see we as contractors are clearly communicating with each other to ensure logistics, programme and safety are regularly assessed and revised as promised, and that updates are co-ordinated and distributed well, without constant individual bombardment with updates. This joint newsletter has been well received by the public and council and praised by the local TRA.